To request a PDF version, email Terri.Sylvester@the-eic.com. 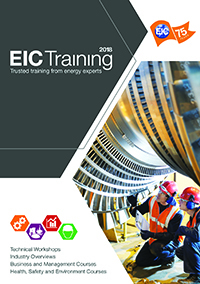 The EIC Training programme consists of workshops and courses developed by engineers and industry experts, whose years of practical industry experience have given them the knowledge and insight to deliver the most relevant training. The course content is regularly refreshed to keep it up-to date and relevant to the latest developments in the industry. All of EIC Training courses can be tailored to fit your business objectives and most of the courses can be delivered ‘in-house’ at your premises - a more cost effective and time efficient way of conducting training if you need to provide training for a number of staff. Training is now being offered by our offices in Houston, Kuala Lumpur and Rio and Dubai, with relevant courses handpicked for professionals working in the local market. For more information on courses and dates available, please see the training schedule. As a certified member of the CPD, the EIC is committed to providing practical continued professional development through our certified training courses and events, for more information please click here. Technical Workshops primarily take the form of presentations held at the premises of host manufacturing companies and often incorporate a workshop tour. This access to the supply chain will allow you greater appreciation of equipment you may be procuring, enhanced credibility and understanding of your customers’ needs and may even open the door to future business relations with prospective customers. Business and Management courses are delivered by experienced trainers using a variety of methods from role play to case studies and group discussion, their main aim is to equip you with necessary skills, techniques and confidence to maximise business success, operate more effectively and further progress your career in today’s competitive market. In-house training involves bringing an instructor to a location of choice to deliver a customised training program for a group of employees. One of the main benefits for employers is the ability to control when the training takes place and scheduling it so that it minimises the impact on their business. Instructors are able to modify training material to meet individual business needs and focus on company issues to ensure the learning is relevant. Industry Overviews provide a comprehensive overview of your chosen sector, delivered by industry experts you will gain greater understanding resulting in confidence when approaching a new sector, credibility when speaking to customers, an appreciation of how your business or products sit within the industry or simply developed knowledge. Health Safety and Environment (HS&E) courses provide direction and guidance from industry experts and international certification bodies enabling you to confidently work within legal frameworks and recognise how they may apply to your business, products and services. It will also allow you to understand customers’ requirements and limitations and when working and supplying into hazardous areas.